Model Ashley Simone displays the art of 2007 World Body Painting Champion Carolyn Roper during the FABAIC in Orlando. I wanted to post this as a contrast to yesterday's black and white image. Most body art that I've viewed seem to use similarly vibrant colors. In my opinion, this piece was one of the stand-out works during the show. That's not to say that other artists didn't create jaw dropping work; they did. This one just happens to be my favorite. Sometimes you see an image in color and it just screams out for black and white. That was the case, for me anyway, with this image I shot of Abby Trent at the Face and Body Art International Conference this past week in Orlando. 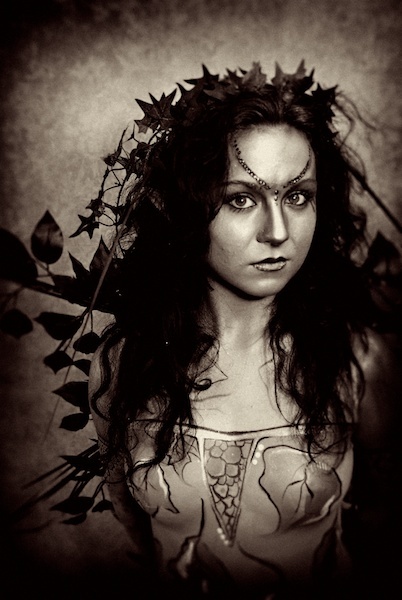 In most cases, body art is so vibrant in color that it's a shame to either desaturate it or change to black and white. To be fair, I thought the original color image was charming. However, I began to feel more inclined to show the lines here instead of the colors. Attorney Rick Helmuth harassed me for years on the Las Vegas Advisor forum using the alias “Buick Riviera.” I discovered his true identity. Tonight, I went out to CityWalk as part of the Microsoft Tech-Ed conference in town this week. They reserved The Groove for jam sessions. I decided this year I'd rather shoot than play, so I packed up my D200 and a couple of lenses. I looked over and there was another man with a Nikon around his neck. I tried to ask the guard what she was talking about, but she kept putting me off with “one second” as she talked to someone on her radio. It had something to do with the fact that I had a professional camera. I explained to her that I wasn't working on an assignment – this is my hobby. My photos are no more professional than the hundreds of people she let enter with a point and shoot camera. No response. Finally, the voice on the other side of the radio had her tell me that I could take photos inside The Groove for my event, but nowhere else in the park. First, that was my intention all along. However, why do they discriminate against a bigger camera? They aren't prohibiting all photography (which is their right), just those of us with nice gear. I explained that I'd been there with my camera many times before without this kind of incident. Brick wall. She doesn't care or respond. I truly hate that kind of mentality and rudeness. It's their property, and they do have the right to say what you can and can't bring. However, I have the right to vote with my money. Goodbye, Universal Studios and CityWalk. There are a couple of things you expect from a Microsoft conference. Big banners are definitely on the expected list and we have them. Probably not as many as I would've thought, though. There's no shortage of PC's available for use to check the schedule and, presumably, do a little Internet surfing. Having already used the web site to build my schedule, I signed on one here long enough to print it off. Otherwise, I haven't bothered, since I dragged along my own laptop. However, there are promises of more prizes to win if you fill out a session evaluation one one of the kiosk PC's. Microsoft opted for something that is either cheesy or creepy (you decide) with some Office characters during lunch. Fortunately, I didn't see them until after I'd eaten. The food was standard convention fare – vegetable lasagna, Florentine chicken, or Yankee Pot Roast.. There was a special diet area for those who didn't want to eat this stuff. When you hit the tables, there were a couple little bits of swag – a tiny fan blower that worked surprisingly well, and some MS Tech-Ed temporary tattoos. Yeah, rock your world. There are snacks in the morning and afternoon. Unlike previous GeekFests (which sadly no longer seem to exist as a GeekFest party), there are some healthy options. I just munched on some apple slices and a banana, in addition to the usual fried carb fest known as potato chips. If there's a disappointment, it's the bathrooms. Women in technology, rejoice! This is the only place where men stand in line while you breeze in and out with ease. The state of affairs sunk lower for men after we got inside. Let's just say that the Orange County Taxpayers are NOT spending enough on toilet paper. Imagine the thinnest one-ply you've ever seen, and then subtract half the paper mass from it,. Enough said. At least the stalls have some local gang artwork.